Tropical forests are one important component of the global carbon (C) cycle. Changes in the carbon standing stock of the tree reflect the balance between growth and mortality (including harvesting) and determine the status of forest as a carbon sink or source. Evaluating the carbon sink function of the tropical forest and confirming the sustainability of wood production is the main goal of the carbon flow analysis project. In this research, we will focus on establishing the data of annual biomass production of acacia plantation forest in tropical area and also relating the effect of the environment constraint to the annual tree growth. This research is performed in cooperation with a tree plantation company called PT Musi Hutan Persada (PT MHP) in South Sumatra Indonesia, which has managed an Acacia mangium plantation forest of 190 000 ha. The research field area is acacia plantation at Unit V of PT MHP, which is around 9 300 ha. We use long-term inventory data collected by PT MHP. The expected outcomes of this research are following; estimation data of standing tree volume, annual increment, the annual/total biomass production at unit V and annual tree growth relation to the data of environment constraint (temperature, rainfall, etc). 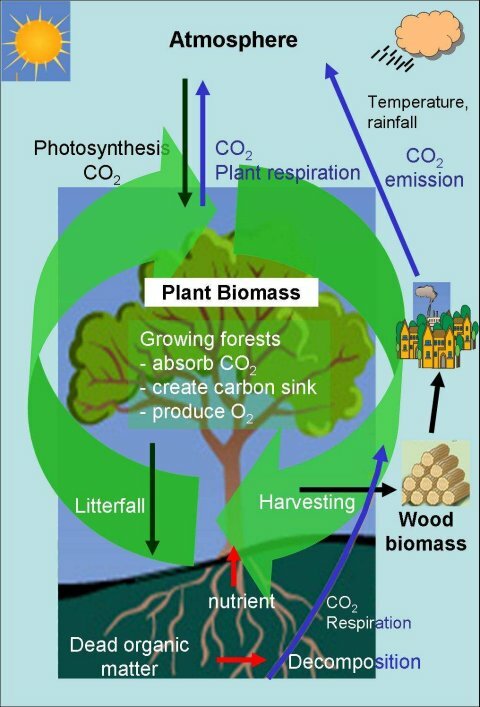 Future perspectives such as soil analysis, carbon flow analysis relating to harvesting wood as carbon pool, carbon balance between atmosphere and arbosphere and from soil to atmosphere, can be further analyzed to get a better understanding of the global carbon cycle.